Hello folks, How are you all? You have saved the password of any particular website in your browser but you forgot that password. This situation happens often as we are surfing lots of websites every day. They have registration and login facility. But how many passwords we can remember? After that you must be searching show hidden password online, show asterisk password, show password tool, show password characters, etc but you can’t find an easy solution like we are providing here. For safe side, we should not use the same password for every website as there can be a possibility of hacking the data of some low-security websites. If you have saved your password in your browser when you logged in to that particular site first time then we have a solution for you. You can easily see password using inspect element trick. Moreover, You can steal the password of your friend using the Inspect element hack password trick. So, It will be fun to do this Inspect element hack trick. Now, We are moving forward to make the password visible. I mean now you can make password visible behind * (Asterisk). So, Follow the simple steps to know how to make password visible. 1 How To Save Password In Google Smart Lock? 2 How To See Password Using Inspect Element? How To Save Password In Google Smart Lock? After registration on any website, you have to log in to access the features of that website. While login you can see that when you press “Login” button a popup will come which ask you about save your password in google smart lock. If you press Save then your login credential will be stored in the browser. You can see the popup block of Google Smart Lock in below image. You May Also Like This - How To Recover Lost Data/Partition From Windows System? Now, When you open that website in the future, Google Smart Lock will automatically fill the login details in the text box. You can see that in the below image. But you can’t see the password here. So, If you have opened the site after 4-5 months or a year later then it is possible that you have forgotten the password. Here, You can access the website with Sign in as normal. But the problem occurs when your device changed or your browser changed. When this happens then you don’t know the login credentials. So what to do in that scenario? How To See Password Using Inspect Element? Right click on the password text box. Click on “Inspect” from options. You can see one toolbar opens. That’s called Inspect Element. Now in that toolbar, Some part is selected automatically. It’s our textbox of the password. Yeah! You can see your password written in the textbox. Funny and Dangerous part comes here. If you are using someone’s PC or Laptop and they have saved the password to Google Smart Lock then you can easily get the password of them by above Inspect element trick. Here, You just have to find the websites to which your friend have saved the password. You can easily get the password by this Inspect element password hack trick. But do this only for fun as it can harm your relation with your friend if you change the password after getting login credential. You can get the password of Facebook, Twitter, Gmail, Instagram, Tumblr, Yahoo, etc. Inspect element hack password is a very easy trick to hack password. 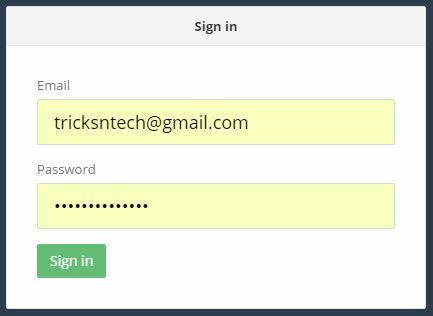 So, now you can easily show password using inspect element. You can reveal password dots of any website with this hack. So, Don’t worry about forgetting password of the websites for which you have saved the password in your browser. You can simply reveal hidden password from web browsers in any PC or Laptop. The above trick is only for educational purpose only. We are not responsible for any type of harm. nice trick buddy….i used inspect element to find plugins and tools useful for my blog…but finding password is really interesting..!!! Wow very nice and helpful artical. We need to learn new things from these blog. Quite Great and informative tutorial you have here man.Never knew there was a possible way to do this in the most simplistic method of all. I will sure be checking this out right away. I recently made a post on how one can easily bypass Quora login page also adopting this Inspect element function/technique. It was a real bomb and I believe you will sure be checking it out. Thanks once again for the laydown. but what was the solution of issue if your G Mail account has been hacked and you need the password. It really works! You can watch our video tutorial on youtube as well. contact me through my email. I never saved my password in the laptop. now i dont know my Gmail password. neither its recoverable. If you haven’t saved the password in the browser then this trick will not work. You can try to recover the password using alternate email or phone number if you added one of them.